In a bakkie-obsessed country such as ours, where the leisure double cab is very much seen as a practical lifestyle choice, but in some instances also a status symbol, the Volkswagen Amarok 3.0 TDI V6 was always going to make waves. Is it as good as the hype suggests, and does it justify the high price? Let's find out! 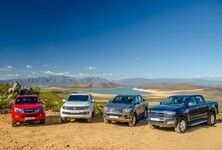 Big Bruiser from Ford: The Ford Ranger has been dominating the top end of the Leisure Double Cab segment in South Africa, with both the XLT and Wildtrak derivatives finding favour with buyers. 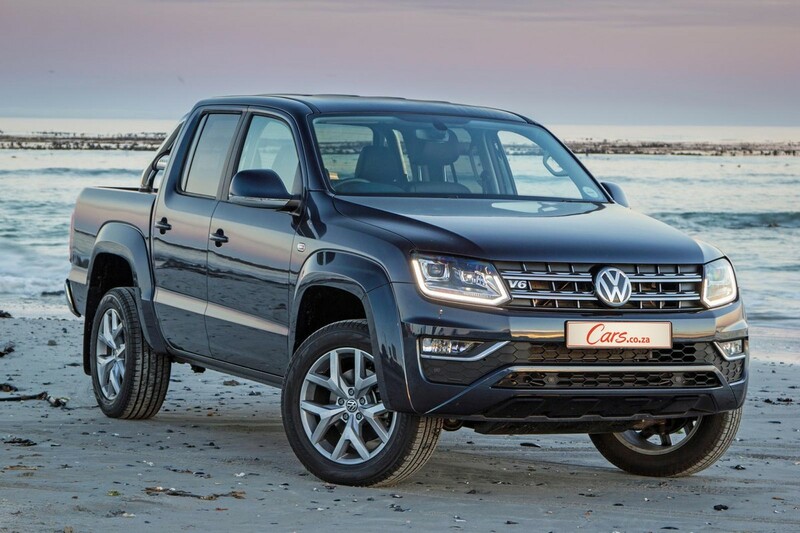 In Wildtrak guise it is our reigning Cars.co.za Consumer Awards - Powered by WesBank champion, but now falls well short of the refinement, power and premium appeal benchmarks set by the new Amarok V6 TDI. Brand new Navara: While we're yet to test the all-new Nissan Navara with its much-debated multi-link rear suspension, first indications are that it will be a strong competitor in this segment. 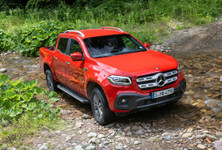 That it will be used as the base for the upcoming Mercedes-Benz X-Class should speak volumes about its inherent refinement. In (current) flagship guise, it is a good R120k-odd cheaper than the Amarok, but neither as powerful, nor as lavishly appointed. Trusted original: The current Toyota Hilux flagship is well-priced at just over R570k, and offers as much bakkie versatility, off-road ability, and passenger-car refinement as most consumers will ever need. But perhaps Toyota should consider a more luxurious version with added features and unique design appeal to head the line-up? After all, it looks like a good few consumers out there would like to have the "ultimate" version of whatever the base vehicle may be. The leisure/lifestyle pick-up market has been identified by several brands as a global growth opportunity in the next decade or so. 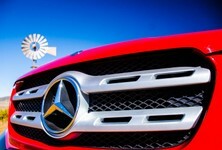 Consequently, Mercedes-Benz will introduce what is said to be world's first "premium" bakkie soon, based on the latest Nissan Navara, which itself is chasing the leisure market with its fancy rear suspension. Renault, too, has plans in this segment, with the Navara-based Alaskan all-but-confirmed for South Africa, which is still one of the world's biggest pick-up markets. But, getting a jump on all of them is Volkswagen, whose Amarok has quietly been racking up impressive sales in the upper end of the local double-cab market, particularly for vehicles equipped with 4-wheel drive and automatic transmissions. 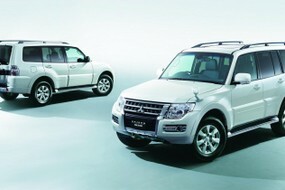 Since launch, around 29 000 Amaroks have been sold locally, and about a third of those were top-end diesel automatics. 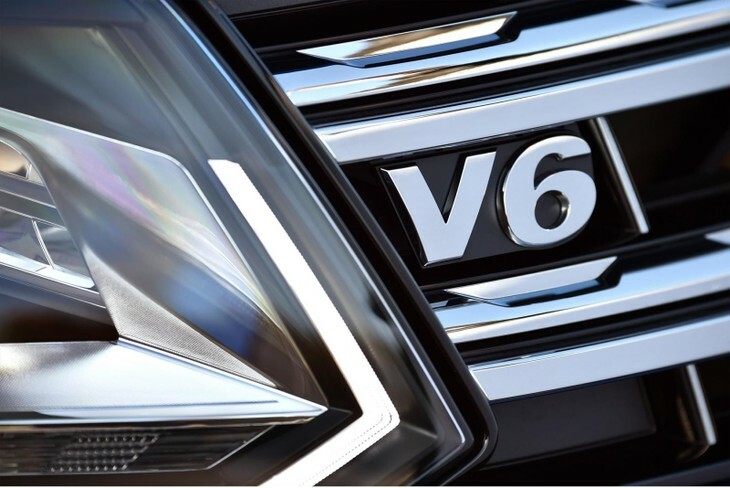 Now, finally, the German marque has added a 3.0-litre V6 turbodiesel engine to the mix – something that many enthusiasts have been begging them to do for years. The engine, straight from underneath the bonnets of premium SUVs such as the Audi Q7, Volkswagen Touareg and Porsche Cayenne, makes the über-Amarok one of the most talked-about releases of the year. It comes at a heady price, however. Any discussion about the new flagship Amarok starts with its engine, so let's not waste any time. This powerplant started its career in 2014, underneath the bonnets of premium cars such as the Audi A6 and A7. It was therefore designed to be good enough for ultra-luxury passenger vehicles, but has been further improved for use in the Amarok. In its latest guise, called Generation Evo II, the 24-valve 3.0-litre V6 has a new variable geometry turbocharger that is said to result in improved responsiveness, across the entire rev range. 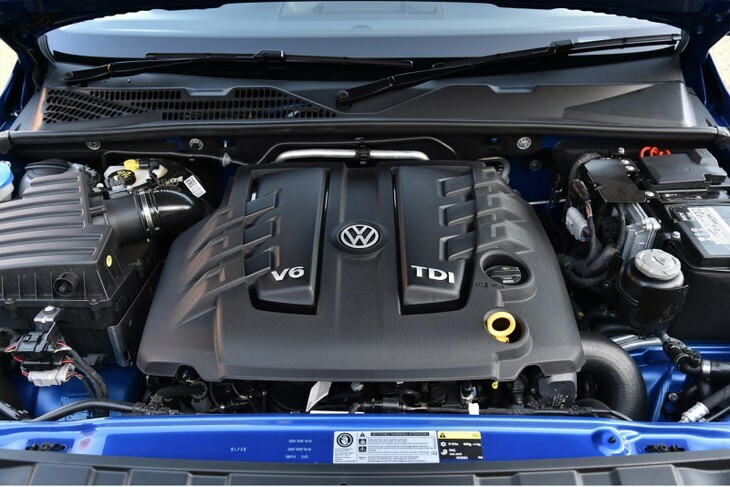 Unique in this segment, Volkswagen says, is a special cylinder bore honing process and piston rings with less downforce that reduce internal friction by around 10 per cent. It also mentions a cooling system that features 2 separate circuits and thinner walls for a shorter warm-up phase, as well as improved fuel efficiency. The Amarok's 3.0-litre V6 turbodiesel engine was developed for passenger cars and upmarket SUVs. It boasts excellent refinement. The result of all of this is an engine that delivers a class-leading 165 kW from 3 000 to 4 500 rpm and 550 Nm of torque, from 1 400 to 1 750 rpm. There is also an overboost function, which for short periods of time – such as when overtaking – lifts the maximum power and torque figures to 180 kW and 580 Nm. 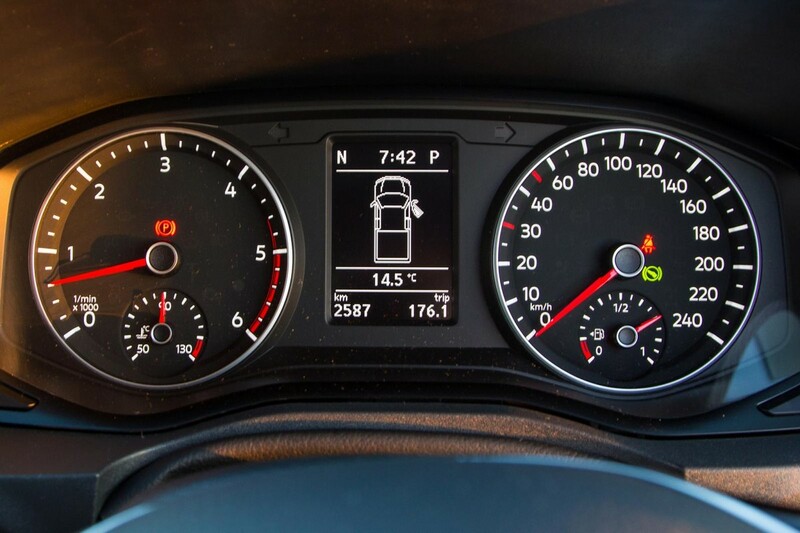 Oh... and the Amarok can sprint to 100 kph in 8 seconds and very nearly cracks the 200 kph mark with a top speed of 193 kph. 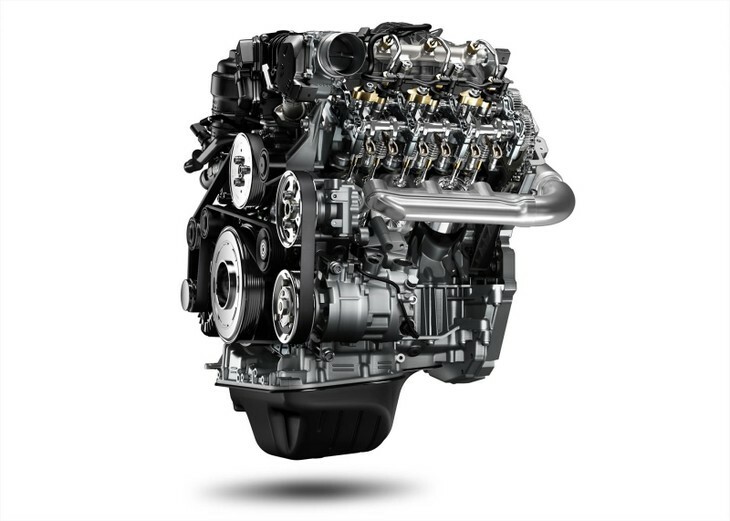 Delivering stonking performance and good fuel economy, the 3.0 V6 TDI engine sets a new benchmark for bakkies. So, what does this all translate into on the road? Quite simply, the Amarok sets a very high new benchmark, not only for performance, but for responsiveness and refinement, too. Turn the key and there's an almost eerily long wait before the engine fires up, but most impressively there's none of the typical diesel clatter that still characterises modern bakkies at start-up. You could really be sitting in a premium-brand SUV... Click into drive, and the Amarok pulls away eagerly in a hushed manner, with good responsiveness to throttle inputs evident no matter what speed you're travelling at. 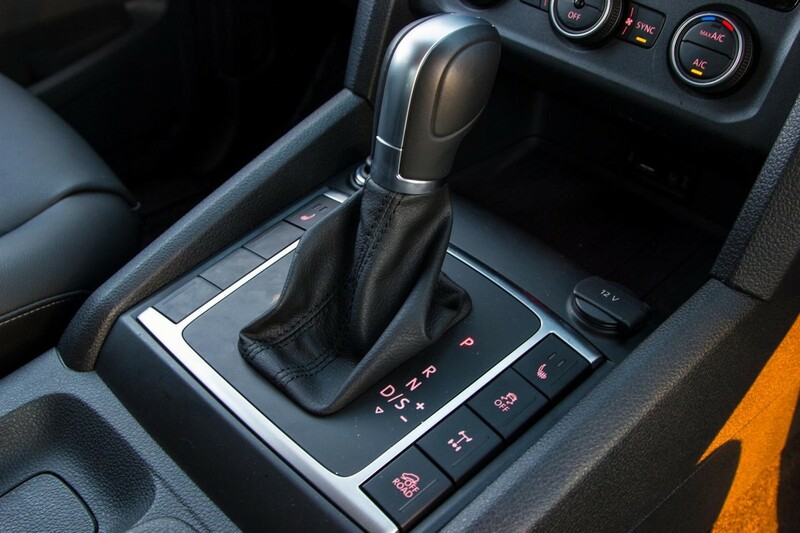 Once up to cruising speeds, the relaxed 8th gear is a further boon, and combines well with the standard cruise control to make the Amarok a superb long-distance tourer. And here's the clincher... Volkswagen claims a combined cycle consumption figure of 9.0L/100 km, the same as Ford's bigger-capacity Ranger. But whereas we had to contend with real-world figures of around 11L/100 km in the Ford, the Amarok's consumption doggedly stuck to the 10L/100 km barrier, despite our "Bush Lamborghini" filming activities... (see video at the end of the article). 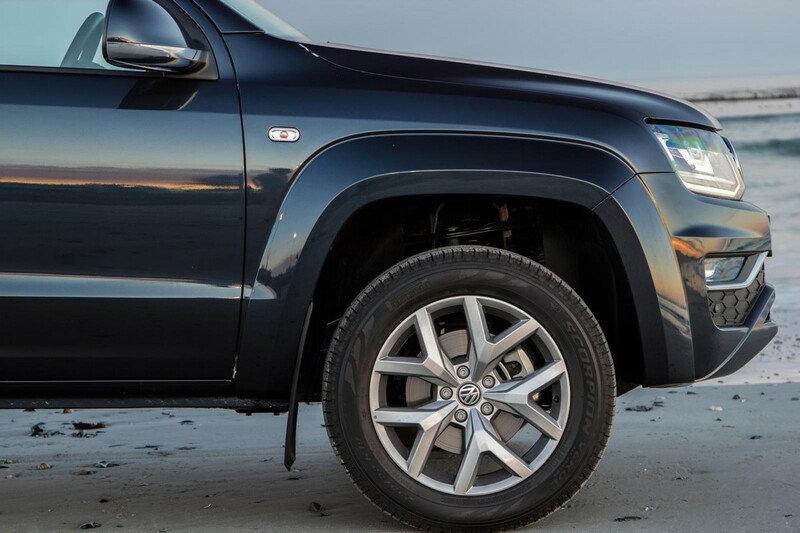 Even on optional 19-inch wheels the Amarok boasts impressive ride refinement. 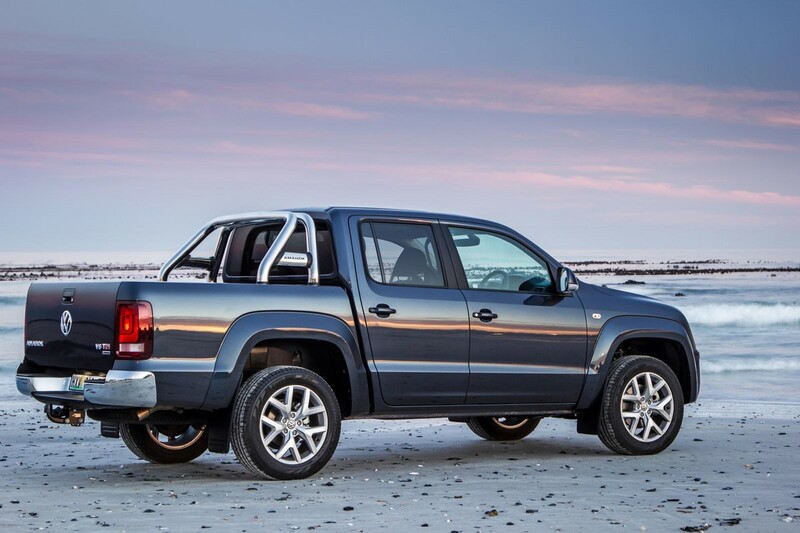 One of the main factors driving the Amarok's success as a leisure vehicle in the bakkie segment has always been its relatively passenger vehicle-like ride quality. Compared with many of its rivals, it is simply the more refined, "supple" vehicle across a wider variety of surfaces. Still, due to the inherent characteristics of its underpinnings (ladder frame, leafsprings), the rear suspension doesn't like transverse ridges that come in quick succession, but the consequences of this trait can be dulled by putting a load on the back. 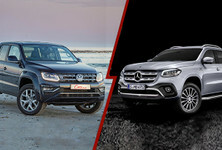 So, while the ride quality may very possibly be the best of the bakkies, and edges closer than ever before to the drive experience of a bakkie-based SUV (such as the Toyota Fortuner and Ford Everest), it can't compete with a normal monocoque SUV. Still, remember the trade-off – you can load a lot on the back, and won't have to worry so much about getting stuff dirty or damaged – this is core to the appeal of a bakkie in the first place. 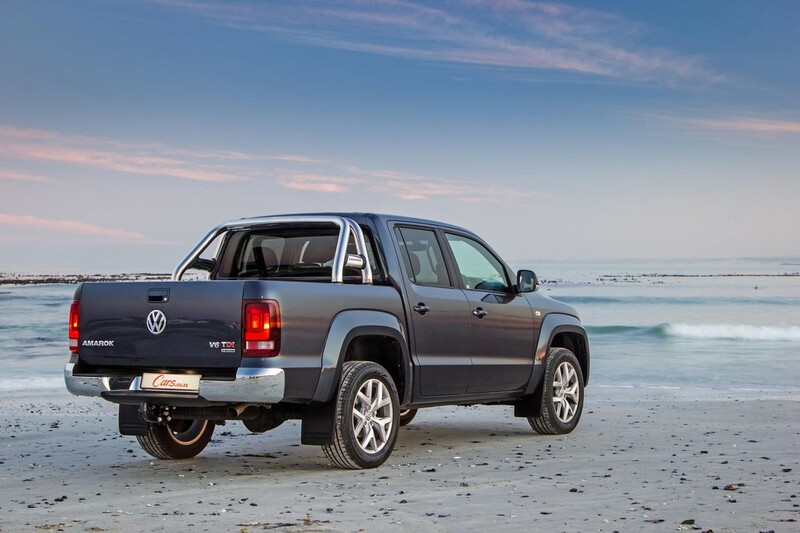 Where the Amarok puts clear distance between itself and other bakkies, however, is in refinement. From the precision of the steering, to the smooth-shifting nature of the transmission, the exceptionally impressive NVH (noise, vibration, harshness) control, and its ease-of-use in off-road conditions, the Amarok really is a bakkie from a different league. The Discover Media infotainment system is standard and includes satellite navigation. Comfort levels are further boosted by a reasonable (for the money) specification level. With rake/reach-adjustable steering and height adjustment for both of the superb front seats, long-distance comfort is not going to be a likely problem. Our test unit also boasted optional heated front seats (R5 000), but the automatic lights and wipers are standard, as are cruise control, dual-zone climate control and front and rear park assist (with camera). The latter feature is particularly valuable as the Amarok is a big and bulky vehicle to manoeuvre around town. 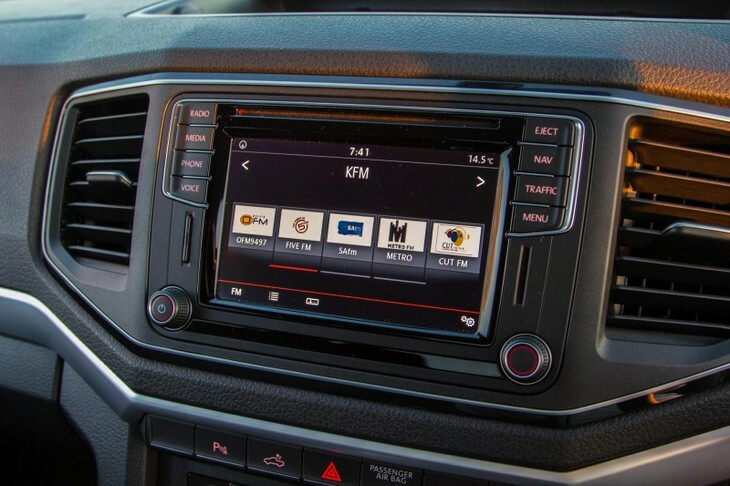 Also standard fitment is the Discover Media infotainment system that features satellite navigation and a neat touch interface with pinching/sliding functionality – Bluetooth and USB/aux compatability is standard. In terms of safety, too, the Amarok ticks a lot of the boxes, even though the fitment of "only" 4 airbags is somewhat disappointing. You still get Isofix rear child-seat anchorages, an electronic stability control (ESC) system with integrated hill-start and hill-descent assistance and, specifically for the rough stuff, an off-road ABS function and a mechanically locking rear differential. 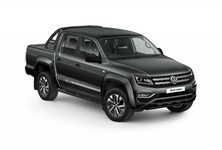 Although the exterior changes are minimal, the recent update has brought Amarok in line with VW's latest design language. 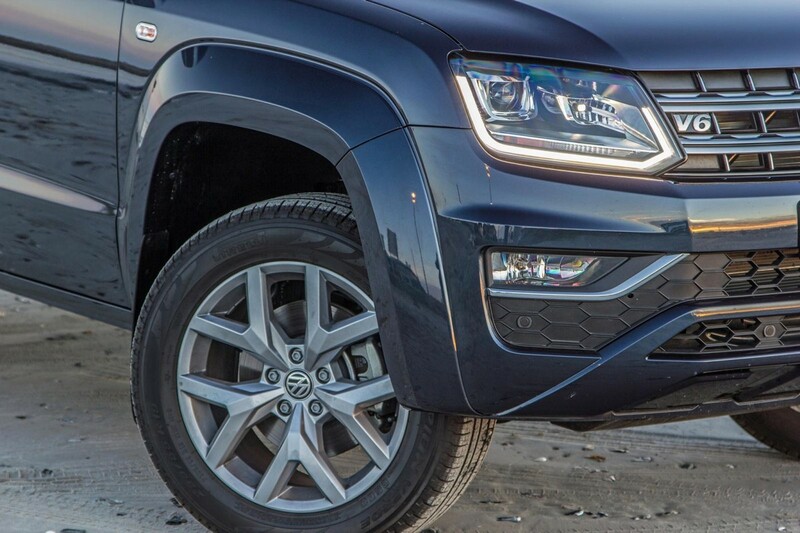 The addition of the 3.0 TDI V6 derivatives have come at the same time as a comprehensive facelift for the entire Amarok line-up. But from the exterior, at least, you'll have to look closely to spot the changes, which are mostly limited to new head- and taillight graphics and a revised grille. This Highline Plus model, tested here, features bi-xenon headlights and LED daytime running lights as standard. Though 18-inch wheels are standard, 19-inchers are offered as an option (as fitted to the test unit) for just under R12 000. It is inside where the bigger changes have been made. There's an all-new facia that is still hard to the fingertips, but which is "softer on the eyes" and which contributes to the overall upmarket look of the cabin, further boosted by standard dual-tone Vienna leather-upholstered seats on this model. 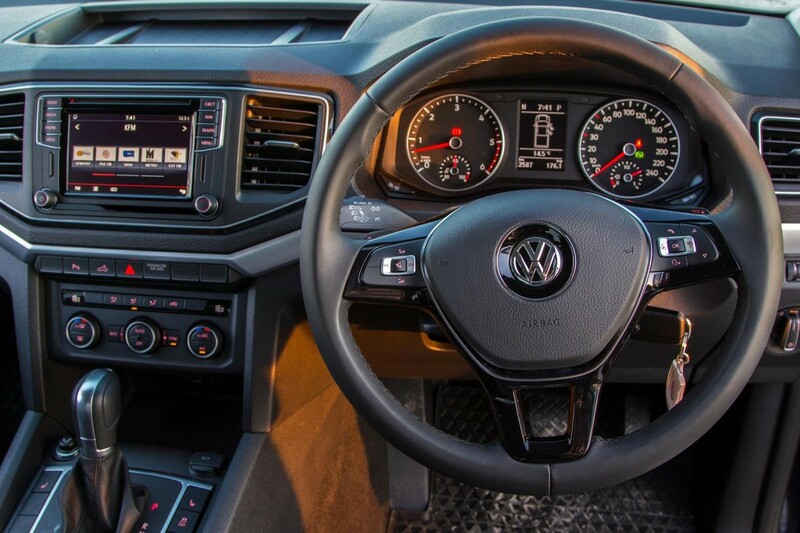 You also get those nice satin-chrome details that make the latest Volkswagens look so expensive inside, and a very neat, leather-wrapped steering wheel. As discussed in the section above, the standard specification level is good, and the fitment of the touch-screen (nav-capable) infotainment system does a lot to make the Amarok feel worth the outlay. Cabin design, finishes and features wouldn't look out of place in a pricey premium SUV. 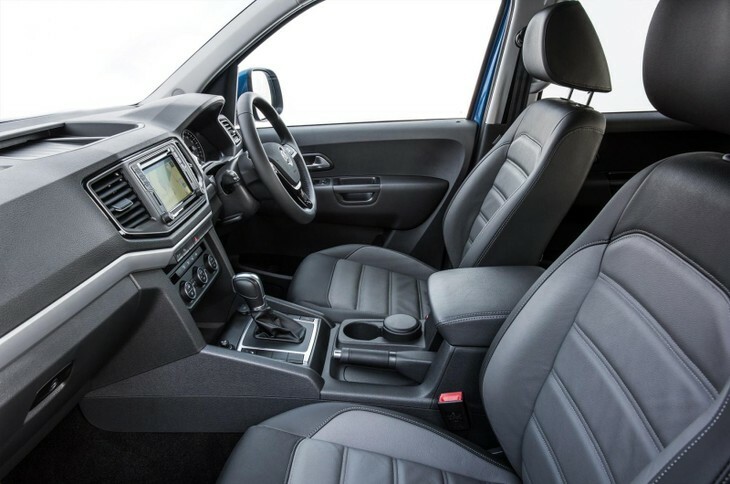 The Amarok's cabin is very spacious in the front, mostly because it is so wide and high. There's enough space for a large storage box between the seats and the front passenger "feels" very far away from the driver. Both front seats are manually height-adjustable, and there really is no shortage of headroom. The attention to detail that is so typical of most VW products is also evident in the Amarok, whether through the rubber padding of the various storage holes (not all), or the actual size of them – the door pockets can take 1.5L bottles! There are also storage drawers underneath the front seats. In the rear, however, the picture is less rosy. While 3 adult passengers can sit next to one another on the bench, they won't be very comfortable because legroom is quite limited. They also will have to sit quite upright, and there are no ventilation outlets for those in the back. It's not entirely impractical, though, because the rear seat cushions can flip up (split 66:33), leaving a very usefully large storage space behind the front seats. The rear seatback can also fold, but as a single piece. 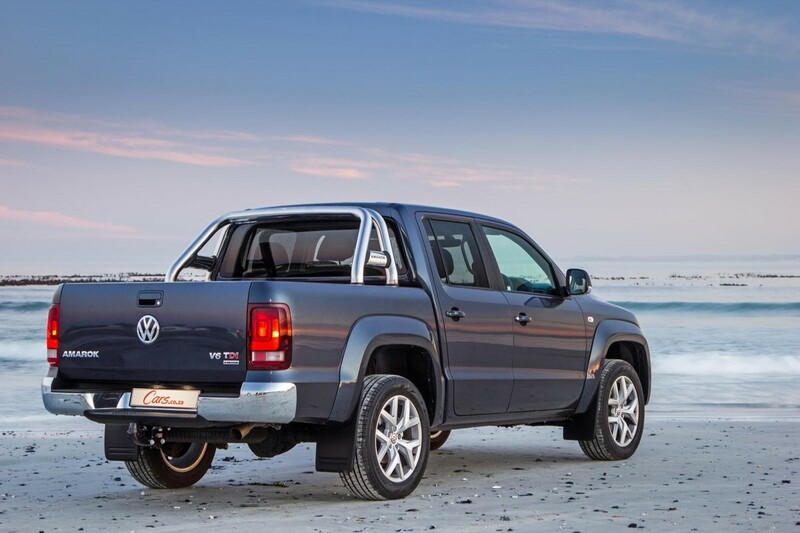 The Amarok's rear passenger area is wide, but relatively short, so rear legroom is lags the best in class. But let's not forget that the Amarok remains a bakkie. At the rear you'll find what remains one of the widest load areas available in the bakkie market (can take a Euro pallet tranversely), and measures 2.52 square metres. The cargo area light remains a clever and unique feature in this segment. Ultimately, however, the Amarok's payload and tow ratings (3 300 kg for the Amarok) slightly lag the best in this class, so if you're really looking for the hardest worker for your money, then you may have to shop elsewhere. 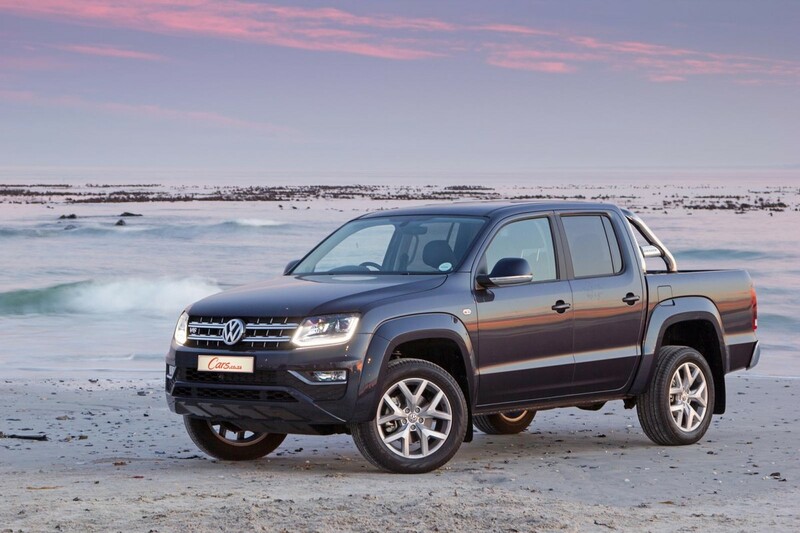 The Volkswagen Amarok V6 TDI Highline Plus sells for R716 600 (June 2017). The price includes Volkswagen's usual 3-years/100 000 km warranty and 5-years/90 000 km service plan. It needs to be serviced every 15 000 km. The badging is subtle, as is the design, but this latest Amarok advanced the art of the bakkie convincingly. So, is the Amarok V6 TDI worth the R100 000 extra compared with its nearest direct competitor, the Ford Ranger 3.2 Wildtrak? Ultimately the answer to that question depends on what you value most in your double-cab bakkie. 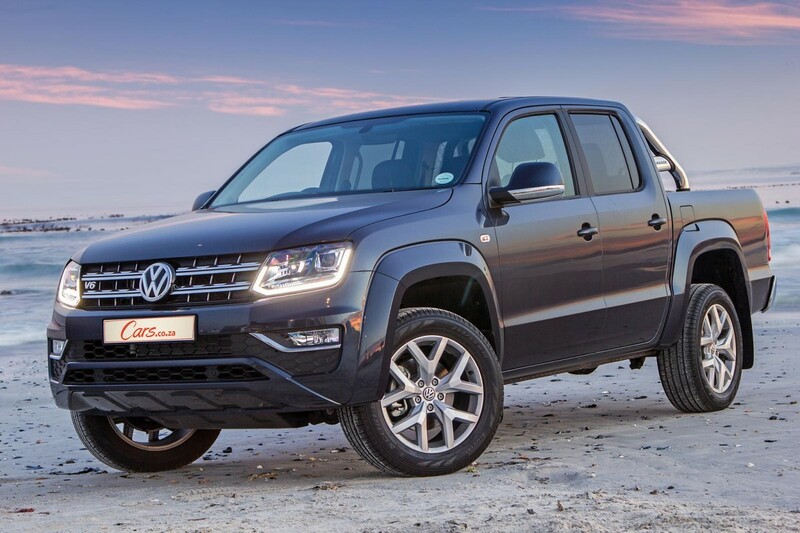 The flagship Amarok easily establishes new benchmarks for refinement and responsiveness, has the most premium SUV-like interior of all, and arguably the best ride quality, too. Although it is still seen by many as a "softie" in the market, it is also very capable in the rough. Where it falls short, perhaps, is in ultimate practicality, with rear passenger space lagging the class leaders. It also can't match some of its rivals' payload capacity or tow ratings. 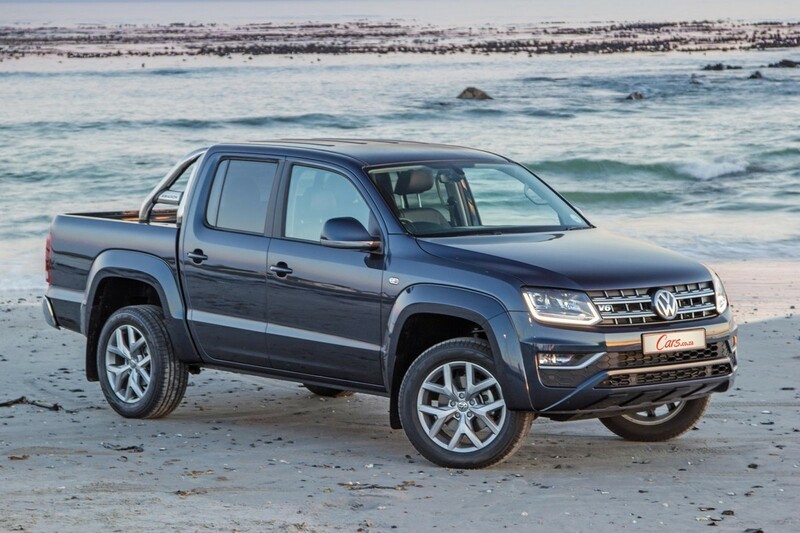 That said, if you want the best "Leisure" or "Lifestyle" Double Cab on the market, however, and you're able to afford it, the Amarok V6 TDI is the new champion, by some margin. 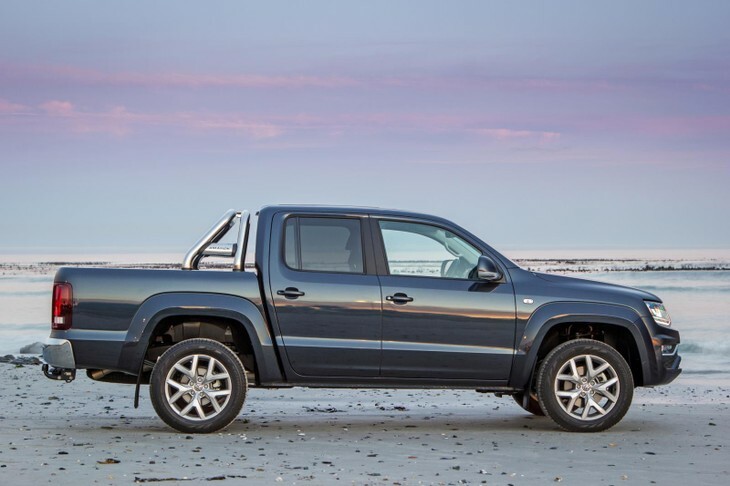 Interested in buying a new / used VW Amarok?